Guaranteed Analysis: Crude Protein (Min), 12.5%Crude Fat (Min), 15.0 %Crude Fiber (Max), 13.0%Moisture (Max), 12.0%. 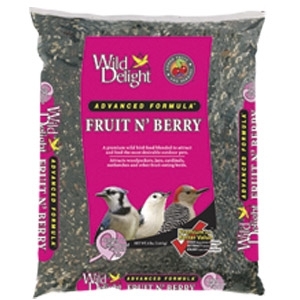 Ingredients: Sunflower Seed, Safflower Seed, Peanuts, Sunflower Kernels, Dried Apples, Dried Cherries, Dried Cranberries, Dried Juniper Berries, Dried Raisins, Vitamin A Supplement, Vitamin D-3 Supplement, Vitamin E Supplement, Menadione Sodium Bisulfite Complex, Thiamine Mononitrate, Riboflavin, Niacin, Choline Chloride, Vitamin B12 Supplement, Pyridoxine Hydrochloride, Biotin, Folic Acid, Ascorbic Acid (Vitamin C), L-Lysine Monohydrochloride, DL-Methionine, Potassium Chloride, Sodium Bicarbonate, Manganous Oxide, Ferrous Sulfate, Copper Oxide, Calcium Iodate, Zinc Oxide, Magnesium Oxide, Dextrose, Artificial Flavor. Features: Real Fruit, Premium Seeds, Added Vitamins, Added Minerals, ??? Electrolytes, Amino Acids, No Corn, No Milo, No Millet, No Chemical Preservatives.